A Solder's Poem called "I've Got Your Back"
Yesterday day was Saturday, November 11th. Three great things are celebrated on this day. It's my oldest brother's birthday, it's the day our son Edward had a successful open heart surgery, and it's also Veterans Day. These three celebrations are very close to my heart. As I was driving home from my brother's birthday lunch, I saw hundreds of American Flags waving from people's front lawns. These flags were put in place by Boy Scouts to honor those who served our country in uniform. For 98 years, Americans have honored those who have served on Veterans Day. This year marks 99 years! At the Arlington National Cemetery, the Veterans Day National Ceremony begins at 11:00 a.m. with a wreath laying at the Tomb of the Unknowns and continues inside the Memorial Amphitheater with a parade of colors to honor and thank all who served in the United States Armed Forces. As I was driving, a radio host read a Soldier's Poem called "I've Got Your Back". The words are heart felt and inspiring. When I got home, I searched Google for the poem and found it. I want to share it with you tonight as a reminder of our freedom and those who have our back. I am a small and precious child, my dad’s been sent to fight. The only place I’ll see his face, is in my dreams at night. He will be gone too many days for my young mind to keep track. I may be sad, but I am proud. My daddy’s got your back. I am a caring mother. My son has gone to war. My mind is filled with worries that I have never known before. Everyday I try to keep my thoughts from turning black. I may be scared, but I am proud. My son has got your back. I am a strong and loving wife, with a husband soon to go. There are times I’m terrified in a way most never know. I bite my lip, and force a smile as I watch my husband pack. My heart may break, but I am proud. My husband has got your back. Those words and the sight of the flags made me pause and truly be grateful for those who currently fight and those who have fought to protect our freedom and our great country. My Grandpa, David James Nielsen, served our country in World War II in the Army and the Coast Guard as a Merchant Marine. 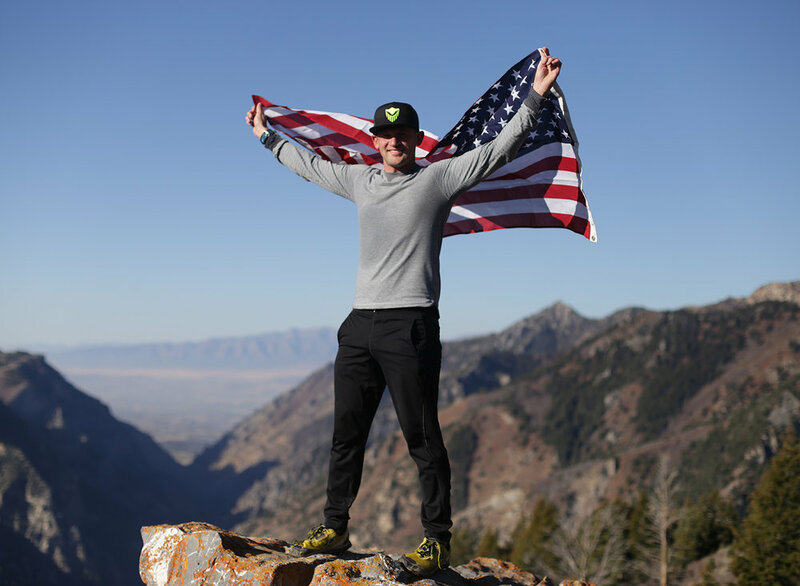 Each year on the day he passed away, I do a run to the top of a mountain peak with an American Flag to honor him. Below is a picture of me flying a flag on top of a mountain to honor my Grandpa! I wrote a tribute to blog to my Grandpa and what he taught me here. My heart is so grateful for those who have served and those who serve to protect our freedom and the freedom the world needs right now.